FCI # 157, Origin: Great Britain, Group 2.2 Molossoid breeds. Grooming: Low, Shedding: Low, Coat: short and dense (with or without undercoat). Color: red, fawn, brindle (all with the black mask). Ease of training: Medium, Energy level: Low, Span of life: 10-12 years. Breed: The emergence of the breed Bullmastiff was dictated by the needs of a particular group of people involved in the protection of private forest land - rangers. And the formation of the breed was happening for over several centuries. The selection of functional qualities and psychological characteristics was led by the following criteria: the dog must be strong, powerful, tenacious, hardy, of medium height and weight, in order to cope with one or more armed men in their custody, but also rather manageable by it's owner. These qualities were cultivated by several generations of people and constantly tested at work not only during the arrests of poachers, but also in the battles with bulls and wild animals. 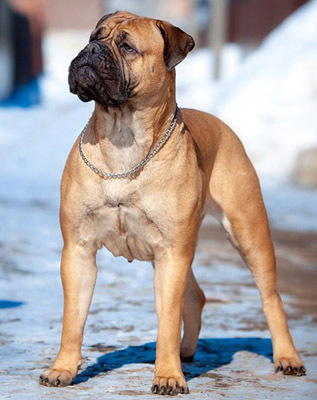 Intermediate breeds of dogs that participated in the formation of Bullmastiff are numerous. From all this list it is necessary to mention the following dogs: the Night Watchmen Forest Dog, the Bloodhound, the Great Dane and the St. Bernard, which at one time was used to improve endurance, functionality and improve the working qualities of the future Bullmastiff in the landscape of Great Britain with it's harsh climate. For the first time these dogs, bred by the commoners and rangers and called "the Night Watchmen Forest Dog", were exhibited in 1876 at London's Crystal Palace. But the owners of the dogs presented were not able to convince the experts from the Kennel Club, founded three years earlier, that there is a need to recognize this group as a breed. Why it happened this way - is difficult to say. Obviously, the experts were not satisfied with the exterior of represented dogs, also the livestock was heterogeneous and there were a lot of evidences of it's instability. Before the British dog breeders of late 19th and early 20th century there was an urgent task to breed a dog that would combine the watch qualities of Mastiff with the courage and fearlessness of a Bulldog, but the dog had to be mobile and more agile than a Mastiff. The successes in breeding Bullmastiff at the dawn of this century, we owe to a leading British breeders, such as B. Hollander, J. H. Biggs of Ostmastone Hall Derby, who became later the first president of the Midland Bullmastiff Club, William Burton - the owner of "Torneywood" in Nottingham and others, who formed the desired breed type with it's behavioral characteristics. In 1924 the English Kennel Club had officially recognized the breed Bullmastiff. In June 23, 1925 the Midland Bullmastiff Club became a member of this organization. The standard, that was suggested by this Club became an official English Kennel Club standard for the breed in September 1925. In January 1926, by the Kennel Club was registered another organization - "National Bullmastiff Club of police dogs." The president of this Club was S.E. Mousley of Burslem - one of the brightest stars in the world community of dog breeders. This figure is remarkable by the fact that he has made a significant contribution to the further development of the breed Bullmastiff at the "factory" stage of formation. The result of the method that was used by Mousley and formed the basis for the formation of this breed until now is cited as a successful solution of problems, that arose before the British dog breeders at that time. To the U.S. Bullmastiffs were brought in 1933 by Mr. J.W. Cross Indra, who bought his dogs from Mousley. And in 1934, AKC has already published it's own standard for the breed, based on the document taken from the British Bullmastiff League. 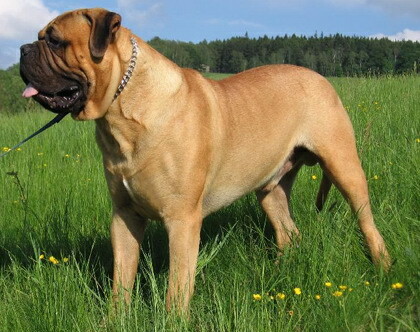 General Features: Externally the Bullmastiff is a large but proportional dog. Height at the withers by the standard should be approximately equal to the length of a dog from the middle of the chest to the top of the hip. Bullmastiff's head is large, square in shape. Wrinkles and folds on the head are desirable. On the forehead between the eyes there must be a furrow. The stop is clearly pronounced, it's angle should be ninety degrees. The small head and the narrow skull are considered a major drawbacks. Bullmastiff's muzzle should not be very short, as in this case, the dog would have many difficulties with his breath, the air will not have enough time to warm up to the temperature of the animal, which can cause hypothermia or overheating. Nose of a Bullmastiff by the standard must be wide, flat and black. Nostrils are wide. The lower jaw is square shaped. Long lips are not encouraged. The teeth of a Bullmastiff may meet both: level and undershot bite. The bite in this breed of dogs may change as they mature. It happens that the puppy is born with the scissors bite, at the age of six months he will have a level bite and in three more years he will finally have an undershot. Bullmastiff's ears resemble the Latin letter V. They fit snugly against the cheeks, that's why the head of a Bullmastiff seems even more squared. The color of the ears should be slightly darker than the basic color but not black. Eyes are dark in color, medium in size with a mandatory border, which is included in a region of the mask. Overly large or small eyes are not desirable, the yellow eyes - a disqualifying trait. Neck of a Bullmastiff should not be short or thin. Ideally, it is of moderate length, in girth is almost equal to the circumference of the head. The tail is set high, its length reaches the hock. Bullmastiff has a smooth short hair, very thick and dense. This kind of coat is protecting the dog very well from a cold weather. The undercoat may or may not exist. It is noticed that the lighter is the color of the dog, the thicker is the undercoat, and the easier this dog tolerates the cold. Bullmastiffs of a brindle color usually do not have undercoat, but in this case it is a lot easier to keep them in the apartment. Temperament: Bullmastiff breed was the result of crossing a Bulldog with the Old English Mastiff. Despite his external gravity and seriousness, this dog has a balanced character. The Bullmastiff is somewhat suspicious of strangers, but he will never provoke a quarrel or fight. In the image of a Bullmastiff anyone can see a clearly pronounced aristocracy and nobility. This breed of dogs does not actually have an aggressiveness to people. Bullmastiff is very smart, his eyes are always very expressive. A certain dog training should be given, but many features - such as activity and intelligence - the Bullmastiff inherited from generation to generation. Training is very important for the Bullmastiff, because it is primarily a guard dogs and this qualities should be properly supported. Mostly the representatives of this breed possess uncommon courage, cowardice is recognized as a serious defect by the breed standard. Bullmastiff is surprisingly calm and friendly dog. Representatives of this breed (if raised up properly) are very responsive and very much attached to the owner. However, for a Bullmastiff sluggishness and laziness are quite typical. Therefore in the training of this dog should not be used any harsh methods and of course beating the dog is completely unacceptable. Any command, that is executed by your Bullmastiff properly should be prized positively. Bullmastiff requires a soft approach to the dog training. To develop the best qualities in your dog it will be quite enough to provide firm and fair attitude. In no case there can be used any aggressive approach, especially when it comes to raising puppies and young dogs between the ages from two to five years. Otherwise it may affect the disposition of the Bullmastiff and make him too aggressive or too timid. The Bullmastiff has a phlegmatic temperament. This dog is characterized by such a traits as balanced character, courage, somewhat reserved attitude and reliability. Bullmastiff is very patient, so he can be a great companion, even for those families who have a small children. For children this dog usually is making a great friend, even allowing them to use him as a "sled dog," pulling a sled with the baby in winter. The natural laziness of a Bullmastiff can not be an obstacle to the game, in which the dog is always happy to participate. As soon as the Bullmastiff appears in the family, he becomes very attached to all it's members and takes an implicit duty to protect his home. Therefore, the dog likes when the whole family gathers in the same place - in this case it is easier for the Bullmastiff to perform his "patrol functions". Bullmastiff is infinitely loyal to his master, and is always closely monitoring his mood. The slightest change in "his" man's voice and a dog will understand how he should behave. In many situations Bullmastiffs can make their own decisions without waiting for the owner's command. Bullmastiff is not prone to the barking for nothing, by nature he is quite silent. In the extreme situations this dog is able to show all his best fighting qualities. But in the same time the Bullmastiff will never provoke a fight or attack a potential competitor. A sense of nobility in this dog's blood. Any attack of the enemy in the direction of the family and the owner for the Bullmastiff will become a signal for the immediate protection. And in this case the reaction of this dog will be faster than the lightning. But even in this case the Bullmastiff will not try to fight "till the last drop of blood" - his task is to stop the conflict and he will behave as it is required by the situation, without any overreactions. Defending his master the Bullmastiff is not trying to hurt the attacker, he is not so bloodthirsty. His goal is only the security of "his" family. Once the threat passes, the Bullmastiff becomes again funny and playful. Bullmastiff is distinguished by an extraordinary patience. His masters are allowed to do with him whatever they like. Even if your Bullmastiff will need a medical treatment, he will be a very compliant patient. Normally the Bullmastiff is not interested in the leadership - he is equally respecting all members of his family. Bullmastiff reaches his physical and psychological maturity quite late. The final formation of this dog happens between two and three years. For a Bullmastiff - as for any other dog - a proper training is a must. Because of their natural intelligence they are learning commands very fast, but you should give your Bullmastiff a little bit more time to execute your command, as he is naturally slow. Health problems: Some Bullmastiffs are prone to cancer or hip dysplasia. Also dogs of this breed are prone to bloat, so it is better to feed them 2-3 small meals a day, than one large.